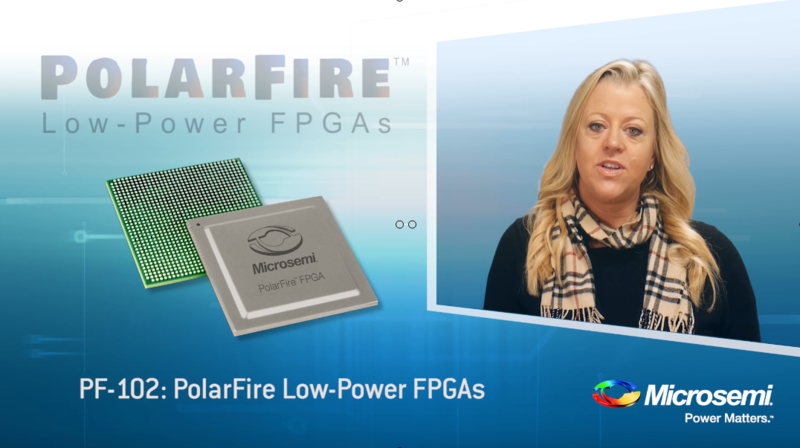 Award-winning PolarFire FPGAs deliver the industry’s lowest power at mid-range densities with exceptional security and reliability. The product family spans from 100K logic elements (LEs) to 500K LEs, features 12.7G transceivers and offers up to 50% lower power than competing mid-range FPGAs. The devices are ideal for a wide range of applications within wireline access networks and cellular infrastructure, defense and commercial aviation markets, as well as industrial automation and IoT markets. Get started with your design today by downloading the Libero SoC PolarFire Design Suite and ordering a PolarFire development kit that best matches your needs. PolarFire FPGAs deliver up to 500K logic elements, 12.7G transceivers at 50% lower power. PolarFire FPGAs offer various device offerings such as design security with transceivers, low power transceiver devices, data security with transceivers, and low power data security with transceiver devices. All PolarFire FPGAs are integrated with multi-protocol industry-leading low-power transceivers. Low power (L) devices provide up to 35% lower static power. Also, data security (S) devices have an integrated DPA safe crypto accelerator. PolarFire Devices are currently offered in Extended Commercial (0ºC to 100ºC) and Industrial (–40ºC to 100ºC) device offerings. 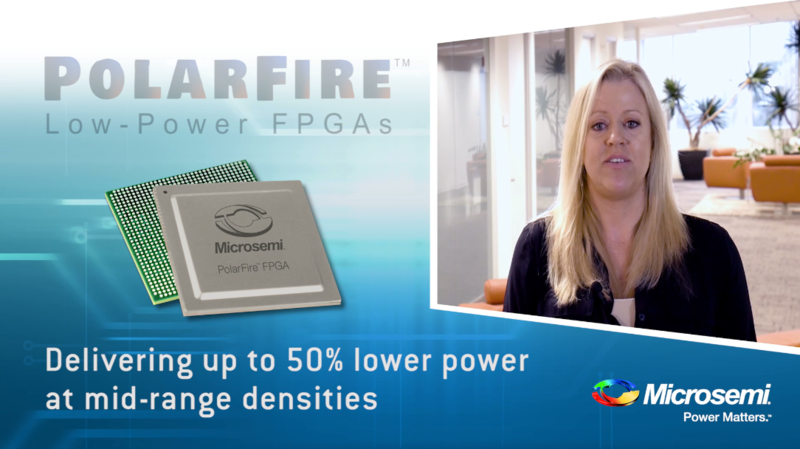 Microsemi's PolarFire FPGAs are available in the smallest form factors for mid-range density devices. For example, the MPF100 device is available in a 11x11 mm package. In addition, Microsemi's PolarFire devices do not require external configuration memories that are typically required for SRAM based FPGAs. The below reports are available upon request only. Please log in to the Microsemi website via https://www.microsemi.com/log-in/ and click on one of the below reports to send an access request. PolarFire Imaging and video user guides, IP, and reference design files are available at the Imaging and Video page. PolarFire Evaluation Kit user guides, schematics, and design files are available in the MPF300-EVAL-KIT page. Demo guides targeted to the MPF300-EVAL-KIT. User guides, schematics, and design files are available in the MPF300-EVAL-KIT documentation page. In addition, a Power Monitor GUI has also been released that can be used with any of the demo designs. PolarFire Splash Kit user guides, schematics, and design files are available on the PolarFire Splash Kit page. Demo guides targeted to the MPF300-SPLASH-KIT-ES. User guides, schematics, and design files are available on the MPF300-SPLASH-KIT-ES documentation page. In addition, a Power Monitor GUI has also been released that can be used with any of the demo designs. Libero SoC PolarFire software user guides are available in the Libero SoC PolarFire page. Quick links to all resources needed to start your first PolarFire design today. Libero SoC Design Suite offers high productivity with its comprehensive, easy-to-learn, easy-to-adopt development tools for developing with Microsemi FPGAs. Microsemi's Partners are engaged in development with PolarFire devices or contributed to silicon design, including Bitec, ASIC Design Services, The Athena Group, Inc., Intrinsic-ID BV etc. PolarFire Imaging and Video Kit offers a high-performance evaluation of 4K image processing and rendering using dual camera sensors as well as numerous display interfaces. Generic IBIS Models: PolarFire are available for signal integrity simulations. Design specific files can also be exported from your design implementation in Libero.